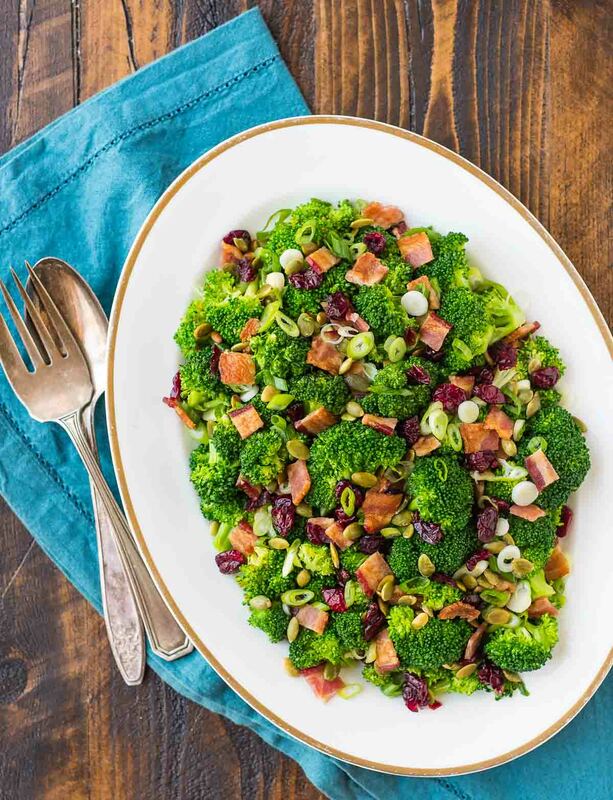 This Broccoli Cranberry Salad is a play on the one my aunt used to bring every year to our Christmas dinner. It’s a little bit naughty (ahem, bacon), a little bit nice (see also: bacon), and the festive red-and-green colors look beautiful as a part of any holiday spread. My aunt’s original broccoli salad recipe called for a creamy mayo-based dressing, but I opted for a lighter vinaigrette-style dressing instead. It keeps the salad nice and crunchy (I find that creamy-style dressings tend to make the broccoli salad become mushy as it sits), and it makes the recipe more of a healthy broccoli salad too, if that’s something you are after. 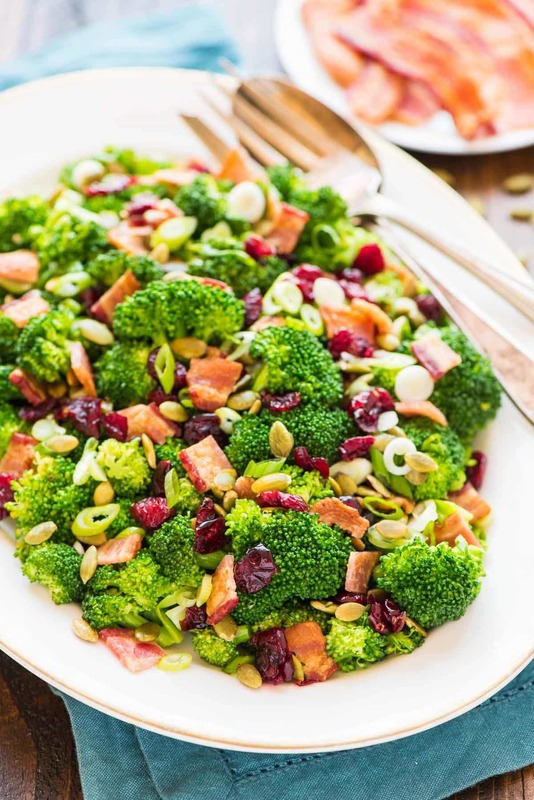 Even if “healthy” is not something you are seeking at the holidays, this easy Broccoli Cranberry Salad is still a winning choice. 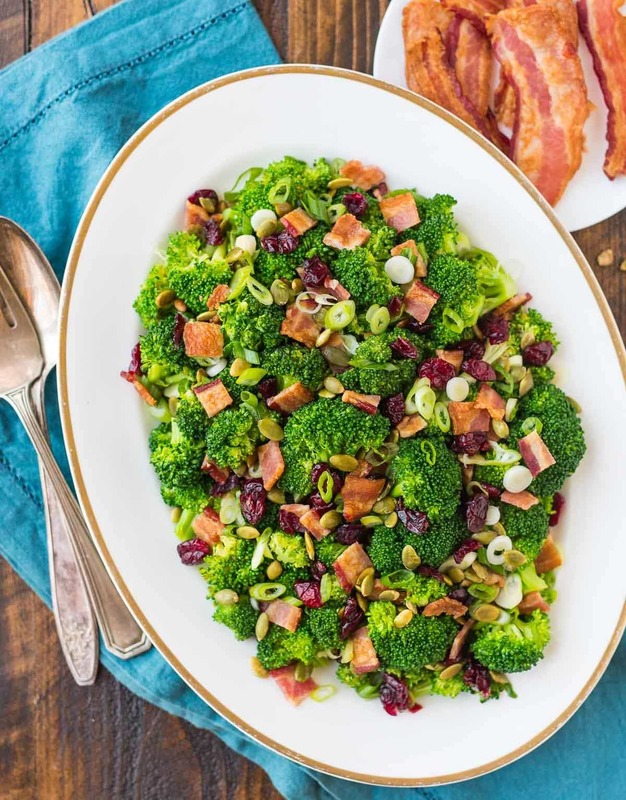 It has lots of interesting flavors and textures, from the crunchy broccoli and toasty pepita seeds to the chewy cranberries and smoky bacon. It can withstand long hours at room temperature, and since it gets even better the longer it sits, it’s a great make-ahead recipe too. Oh, and it does not taste like a healthy broccoli salad, even if it is on the more wholesome side of the holiday standard. Now I’m not saying Santa would opt for Broccoli Cranberry Salad over allllllll of the cookies, but even he would find space for this easy, delicious side. Enjoy the green goodness like Broccoli Cranberry Salad in Holiday Feasting Round 1, then help yourself to the treats in Feasting Round 2! 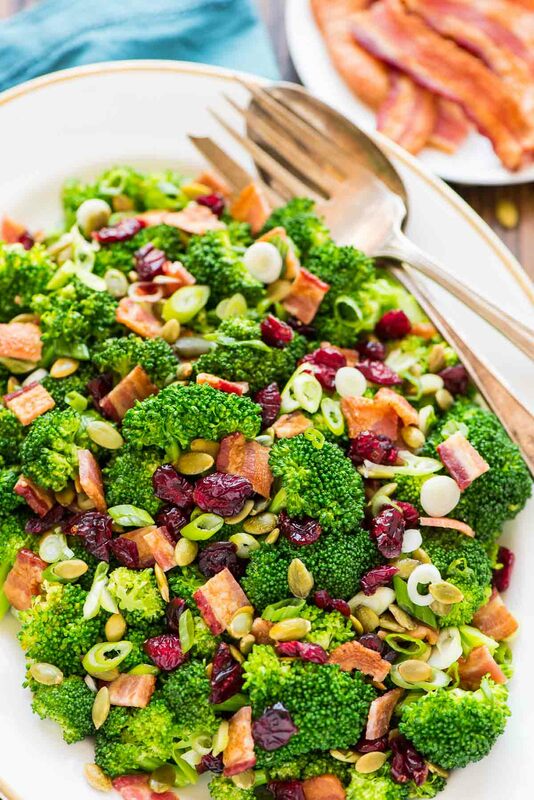 Broccoli Cranberry Salad with Bacon, Pepitas, and Honey Dressing. Easy, delicious, and can be made ahead, so it's perfect for parties and potlucks. If necessary, cook the bacon according to these easy steps. Once cool, crumble and set aside. Blanch the broccoli: Bring a large pot of water to a boil and prepare an ice bath. Add the broccoli florets and cook until crisp-tender, about 1 minute. Remove from the hot water with a slotted spoon and plunge immediately into the ice bath to stop the cooking and set the green color. Drain, spread on a clean kitchen towel, and pat dry. Transfer to a large kitchen bowl, then add the green onions and cranberries. Make the dressing: In a small bowl or large measuring cup, whisk together the olive oil, rice vinegar, pepper, salt, and 1 tablespoon honey. Taste and add a little more honey if additional sweetness is desired. Pour over the broccoli mixture, then toss to coat. Refrigerate until ready to serve. Just before serving, top with crumbled bacon and pepitas. Can be made and stored in the refrigerator up to 1 day in advance. Top with bacon and pepitas just before serving. Leftovers will keep in the refrigerator for 2 to 3 days, though the bacon will become somewhat soft. Not weird AT ALL. :) Thanks, Sarah! This sounds like a very nice salad. I like the idea of a vinaigrette for it, and appreciate the fact that you don’t leave the broccoli raw – I just have never cared for raw broccoli. It will be interesting to see if I could find reduced sugar dried cranberries. I am adding this to my Whole30 list for January – a couple quick mods and I’m good to go!! Thanks babe, it’s gorgeous! You’re welcome, Megan! I hope you enjoy the recipe! hey girl – this looks amazing! Yummy! This was fabulous! Served this to my entire family for our Christmas get together today and it was a true hit. I think I could drink this dressing. First time I’ve ever tried rice vinegar — you are really expanding my horizons — and we all enjoyed this beautiful salad. Had just a bit left and I will be enjoying it tomorrow! Thanks for sharing such wonderful, beautiful and tasty recipes! YAY!!! I’m so happy to hear that Tami Thank you so much for trying this recipe and not being afraid to go for the rice vinegar. I love that you went for something new. I hope you had a very Merry Christmas! Can you use fresh cranberries and Truvia? How long would you have to cook them? Hi! I haven’t tried either of these substitutions, so both would be an experiment. The fresh cranberries wouldn’t need to be cooked, but you should be aware that they will have a very tart taste compared to the dried. I would recommend sticking with the maple vs. Truvia for the dressing. In addition to sweetness, it also adds a nice flavor to the recipe that Truvia alone would not. If you decide to make the recipe, I would love to hear how it turns out! Made the salad today in order to take to a BBQ. Looks beautiful. Vineagrette tastes yummy. Curious, if you had “liquid” on bottom of bowl?? Does it hurt veggies? Looking forward to supper. Deanna, I am so happy you enjoyed this! The liquid won’t hurt anything. You can either transfer the salad to a different bowl (discarding the liquid) or simply serve with a slotted spoon. Happy Fourth of July!